Who is happy with just 'bookshelf' loudspeakers? Discussion in 'Audio Hardware' started by felix.scerri, Jan 25, 2014. G'day all, I've been having some 'fun' with large loudspeakers lately but for most of my hi fi life I've mostly used high quality bookshelf loudspeakers and I really like the sound of good quality bookshelf loudspeakers. I guess the only real 'penalty' is a lack of the lowest bass but on the positive side, I've always regarded the transient performance of bookshelf loudspeakers as their strongest point. I do have an active subwoofer to augment the bass on one of my bookshelf speaker systems, but a lot of the time it isn't really needed. The little bookshelf loudspeakers that I have in here are rated down to about only 60 hertz, but they still deliver a satisfying bass response. Is anybody else 'happy' with just bookshelf loudspeakers on their systems? Regards, Felix. rbp, RickH and PhilBiker like this. I recently "graduated" from floor standing speakers to Castle Knight 3 bookshelf which I have stand mounted and am very happy with the bass response. The stand is tubular so the bass is directed down and with positioning the bass is also radiated from the rear port and refracted off the wall. I find these speakers provide a warm full sound. I haven't felt the need for a subwoofer as i think the midrange would suffer. My Triangle Cometes have some output at 50 hz from the Stereophile test CDs, which works for me. I use them in my home theater set up with a Sextan center channel, all without a sub and I am satisfied through an old Pioneer Elite VSX-21 5.1 receiver. I also run a turntable through it with an outboard phono stage and listen to vinyl on it now and again, but it would be my 3rd tt system. I do own quite a few music videos and concerts that I enjoy through them as well. The Cometes are very nice speakers, probably the most accurate compared to my old Large Advents and AR-58's. I use Ascend Sierra 1 bookshelfs and they are more than enough for my small room and have plenty of bass. If anything I sometimes wish I had smaller speakers! My Paradigm Signature 4s are larger than most stand mounted speakers, but in many ways the larger cabinet of a 2 1/2 way in a smaller room can give you the best of both worlds. They image very well and the bass response is surprising even 3 1/2 feet out from the wall. I can enjoy small speakers as long as they get into the 50 hrz neighborhood I don't miss the lower bass much. On stands they can be imaging champs. Truth is though I still love bigger speakers with deep bass output the most of all. My poor wife. Not I, said the duck - if I don't have true 30hz from my Vandersteens, well, that's a mood changer right there. audiomixer and PhilBiker like this. An upright bass has what, close to an octave below 50hZ? I suppose it depends on what you like. I've heard some very impressive sounding bookshelf speakers, but it's different. When you close your eyes, you can tell. One of the things I like about attending live performances - amplified or not - is the physical sensation of actually feeling the music on top of just hearing it. It takes a lot of moving air to simulate that effect, which is just difficult for a smaller speaker to do. My diminutive ProAc Tablette 50s have surprisingly good bass, 19 years usage and no desire to replace/upgrade them. hifisoup and shutdown66 like this. For small rooms there are bookshelf speakers that are true fullrange, they just have to be competently designed. No a speaker lacking in the bass just is not good enough. For the small volumes that is normal with these types of speakers it´s very difficult to get a low bass using bigger drivers than 5", as a role. I always thought of my 1Bs as bookshelf speakers with built-in stands. I think I get just enough for my room with 8" drivers. In my 9 x 12 room, bookshelves are the only logical choice. Paired with a sub, I am very happy with what they can do in this limited space. I tried them in the open living room once, and they sounded very 'small' though. DLant, bluemooze, rbp and 3 others like this. soundboy and mace like this. I have a pair of Paradigm Signature 2, v3, which sound lovely in a smallish medium-size room. 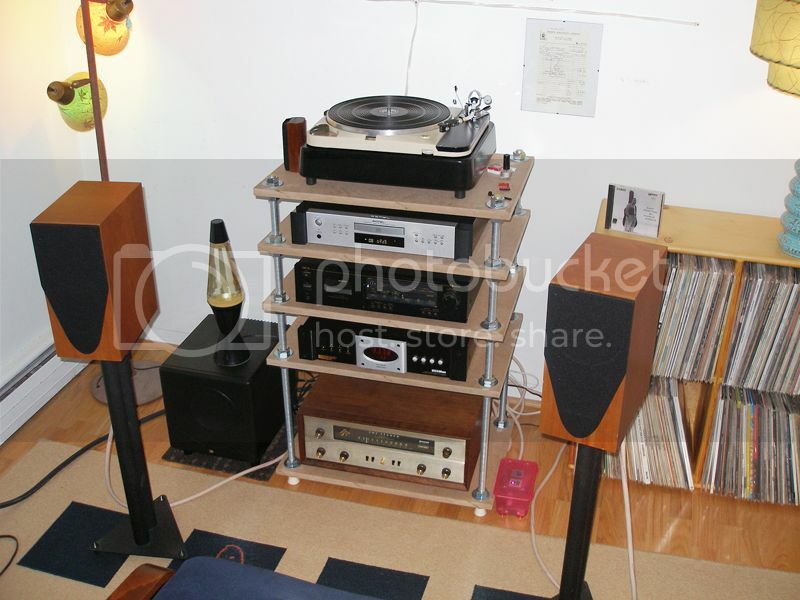 In almost 40 years of stereo ownership, I have never had floorstanders, but only because of financial or space constraints. Would love to get a pair of Monitor Audio PL200s, but I don't have $9,000 burning a hole in my wallet. Bookshelves give the you the best bang for the buck (IMHO). I love the stand mounted Mirage 290iS front speakers and shelf mounted 90iS rears in my office. I have them paired with a modest sub and I think the sound is terrific in a 4.1 configuration. They do offer some decent bass on their own but I can't crank them up loud without blowing a woofer. Thankfully a few years ago when I blew a woofer Klipsh was able to sell me a replacement. I need high volume playback in order to woodshed practice for my band. I was really surprised at what my Boston VRM-60's were putting out in the showroom...it was like one of those Scooby-Doo "-ruh...?!" moments. I kept walking around to see which other speaker pair they'd left on. These are my fronts, with Tannoy Proto-J's in the rear. bluemooze and HAmmer like this. I have a pair of Revel M20s, which are chunky for a 'bookshelf' speaker. They are clean and go down into the 30s. They're in the bedroom now, but I could happily live with them in my main system. timind and tmsorosk like this. Same could be said with my speakers they have 8 inch drivers as well. The size of my room could justify bigger speakers but I don't feel like I need them. Strictly speaking- isn't the OP asking "just bookshelves" - meaning no sub? If so, no, I wouldn't be happy with 'just' my bookshelves - they do need a sub, imo, to properly fill out the bottom end and anchor the whole soundstage presentation. ZAck Scott, QBNCGAR, JohnT and 2 others like this. Have ADS 980's from the 80's still going strong. I have enjoyed the sound from my fairly inexpensive bookshelf speakers paired with a sub. I enjoy them even more after recently upgrading my phono pre. I believe with a couple more minor upgrades I will like them even more still. I am trying to make sure I am getting the most out of them and I believe I can be happy with that. I guess that's a good point, and I agree. Good catch on that. The sub does make quite a difference in my set up. Hello Felix, I use a pair of Pioneer BS41-LR's in my livingroom . Sometimes , I feel the need to boost the bass a bit. Overall , they do what they are intended to do. They are mounted on stands. This is my temporary listening area, so I'm okay with them. Is that a Sony DAT I spy on the 3rd shelf?